We offer our very best wishes for you and yours this holiday season. Merry Christmas, Happy Holidays and Happy New Year. 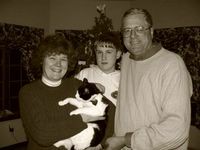 This is our famly "Christmas Letter" for 2005. 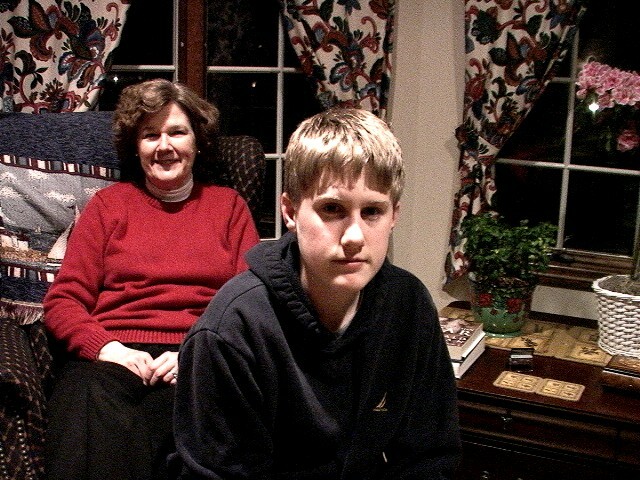 Alex is 14 now and enjoys playing Lacrosse. He enjoys sports activity and has recently taken an interest in physical conditioning with weights. You can't tell from this picture, but he is 6' tall ( 2" shorter than Vic). Alex is now a freshman in High School. He most enjoys his History classes. French is his language of choice to study and he is beginning to make some headway. Oui! Karen enjoys her challenging work with ISI. Travel has not been intensive the later part of 2005 - but there are conference calls/net meetings all the time - early and late - to accomodate worldwide team members. Getting "Marsians" from around the world to use the same computer system isno small endeavor (different languages, cultures and laws). Vic has a number of media projects underway. This "video blog" is one of them. Our families in Hurricane Alley are relatively dried out and in reasonable repair now (Ivan and Dennis). We wish there was more time to visit our families "down home" as parents and other family squarely face the the affects of age. 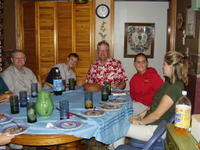 A number of cousins and friends, or their children are directly involved with our nation's efforts in the Middle East. We pray for their safety and that their efforts will allow peace to have a chance to bloom for the people in that region of the world. Here are some more links. ME3TV (a means to present local TV programming without any dependence on cable television). Currently there are two video blogs there; INCOUNTRY and Eggzono973. Under "Incountry" I posted my nieces singing a Christmas song for you. They are also posted at DAILYMOTION.com singing Tiptoe Through The Tulips. They are funny! You may remember the Snowfall video Vic did few years ago. It is now a DVD. Segments from it are now put to poetry by fellow entrepreneur, MJ Trenkler of Jacksonville, FL. One is posted on this page. Enjoy the snow! 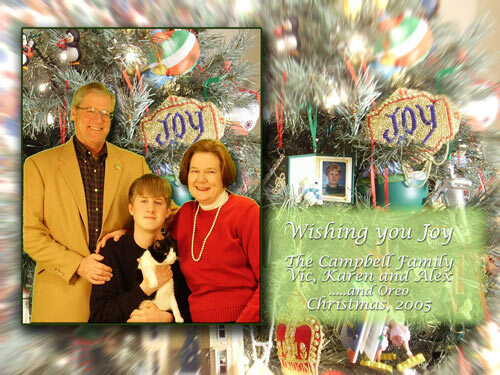 This year, we are mailing cards to our family and friends without internet access. I hope you don't mind! Here comes 2006! Our best wishes to all of you, Vic, Karen and Alex. M.J. Trenkler's poetry takes this short video to the screen as a "Snow Card". Makes a nice card email to friends in the wintertime. This is NJ Scenery shot by a Chumucklan and put to poetry by a Jacksonvillian whose roots are in Chumuckla. Trenkler and Buzz Creek plan a whole series of video-poem cards. This is a 'virtual' project using new media over the internet and collaborators that are 1000 miles apart. The producers hope you will enjoy the scenery and the thoughts. Interesting trip to say the least. The Florida Gulf Coast remains a target but I can't solve that problem without a lot more time discussing the price of oil in China and the solution to world peace with my 5 AM coffee club at the Tom Thumb at Chumuckla Crossroads. So, I am back in New Jersey. I agreed again to put the Sussex County Community College, student newspaper together. Last year, in the Fall, I managed to put out four or five of them from my virtual location in Milton, FL. This year, I was only gone for two weeks and the next issue was not due until I got back. We don't get many hurricanes in NJ, so you would think putting out a campus newspaper from Sparta would be simple. But, alas my computer's Window's XP video drivers were destroyed by a video game my son downloaded on my computer. He will survive, and the therapy will probably do me a lot of good. The barn is not yet done 'down home' but is near. Scott, who is doing the work is one of my favorite personalities (I hope to tape him one day for Eggzono.tv). 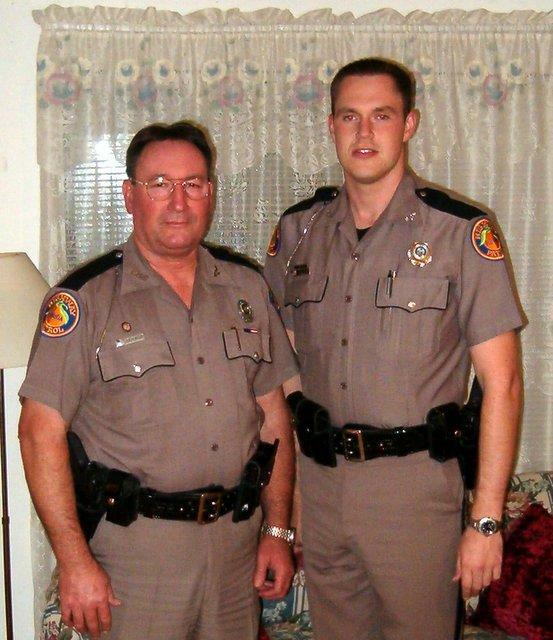 Last year he was arrested for having a half dozen loggerhead turtle shells in his posession. He was cleared. They were not endangered and they are not restricted. However, the courts did not relase the shells to him after he was acquitted. I think maybe one of the lawyers needed a wall display for his rec room. I am ordering a few more sheets of tin from South Alabama Metal Works in Brewton, today. That should let Scott finish the barn. More later. 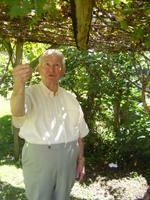 I am about to go tape a philosophical point of view by Dr. L. Harte, here in Sparta. Instead of preaching about taking care of teeth after taking Alex's braces off, he gave a 3 minute philosophy of life that I consider to be one of the most succinct and direct sets of instructions for living I have ever heard. So look for it soon on Eggzono.tv. Rita has been a fickle woman. She turned away from us and we were not at all disappointed to have her go another way. Of course, we've got enough bottled water to last 2 weeks & batteries for a lifetime. restaurants and stores were closed down along the way. They were fortunate because there were some people that had been on the road almost 24 hours coming in from the Galveston/Nassau bay area. I want to thank you Floridians for your Survivor Tips. Especially Jerry Ranger offering a place to stay. Only thing, we would have had to drive a northern route to swing down south to Florida because the normal I10 route goes through Houston and is destroyed in some parts in Louisiana. these storms are and it's in God's hands. Hopefully, our DeQuincy family received at most minimal damage. I need a day to catch up on washing linens, etc and will be back to the old routine and responding to emails in no time. The easterly course coupled with the weakening storm and, our western location resulted in essentially zero effects in Cat Spring. We did have some breeze overnight (10 knots) and, perhaps 0.25 inches of rain ... not nearly enough to result in a lifting of the burn ban which has been in effect for the past several weeks due to our extremely dry conditions. So, all in all, good for us. I got to visit a lot of folks while I was 'down home' even though Ivan and Dennis took up most of my time. 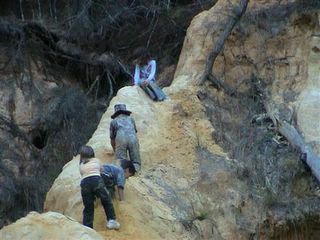 Here are some photos: and the descriptions are here in this text. 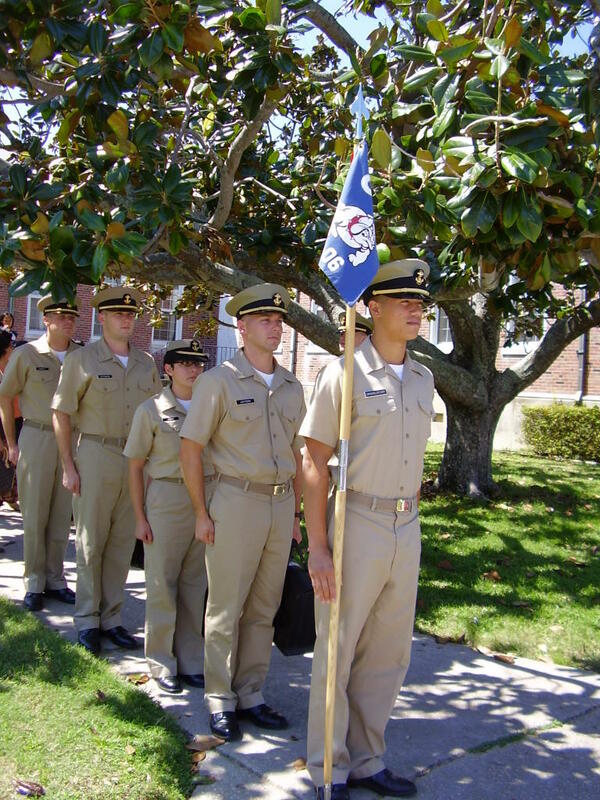 The miltary people are Navy Officer Candidates at Pensacola NAS where I attended Church last week. I nearly had a flashback to my own OCS experience at Newport RI in 1970. Fortunately, with therapy, I am ok, ok, ok, o.... today (almost normal - neck still twitches). I had coffee every morning at about 5 or 6AM with the "DP" club at the Chumuckla Tom Thumb. This is where you learn how to find help to fix a barn, or get a bulldozer or how to buy tickets for the Biloxi gambling bus (for now you get tickets to Las Vegas ... or maybe Vicksburg) or explore the psychology of why land prices on the water soar after a hurricane. 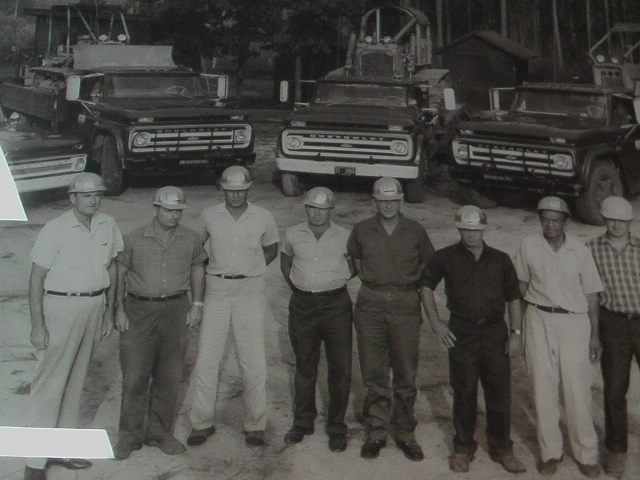 I went to Bonifay with Jim and Mom on my birthday and ended up with a bunch of cousins, Aunts and my Uncle Bobby presenting me with a birthday cake. Uncle Bobby (shown picking scuppernong grapes (niagara) told us the best stories of growing up in the 'canebrake' and my video batteries were dead. 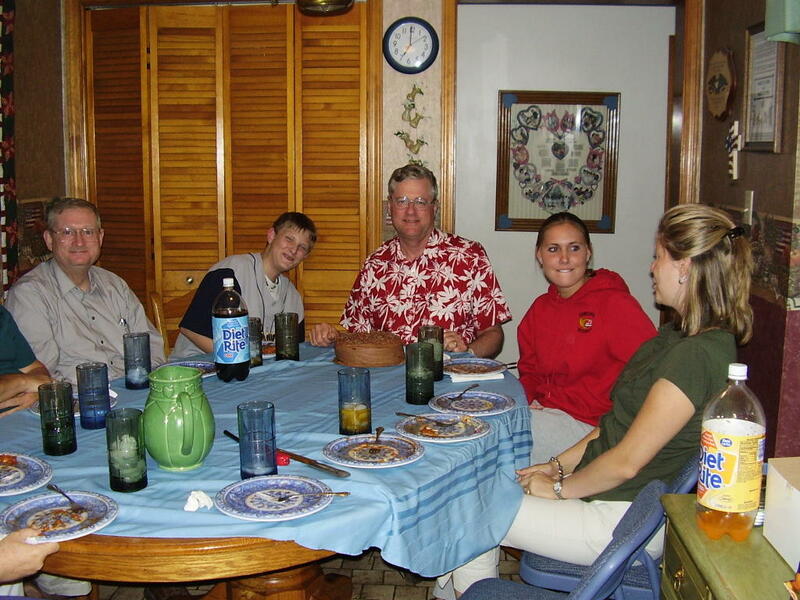 Later that day in Pensacola I had another cake at my sister's house. Earlier, I had gone to the "OPRY" in Chumuckla. I don't have photos of the Farmer's Opry, but I did tape some great material from the Sawmill Band that I may present on the video blogs from www.eggzono.tv . Just as I was leaving to come back to NJ I had a short visit with Marion Tidwell who was working on the Elizabeth Chapel grounds (destroyed by Ivan) to get ready for the groundbreaking ceremony on Sunday. 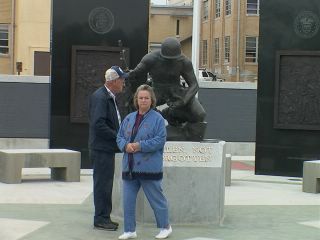 It is his niece, Mary Jo Trenkler who writes the poems about the area that are on Chumuckla.net. I wanted to get MT videotaped in an old truck with a small child to illustrate "riding in granpa's truck" which is one of the poems MJ has now provided with audio. That will come later. I had to catch a plane back to NJ. 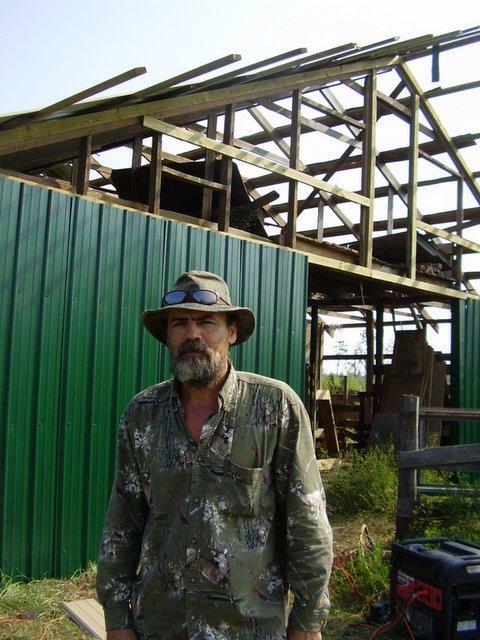 I am getting the barn near to completion. The tin is yet to go up but Scott has it ready - almost. I confirmed why education is not a good thing ... again. 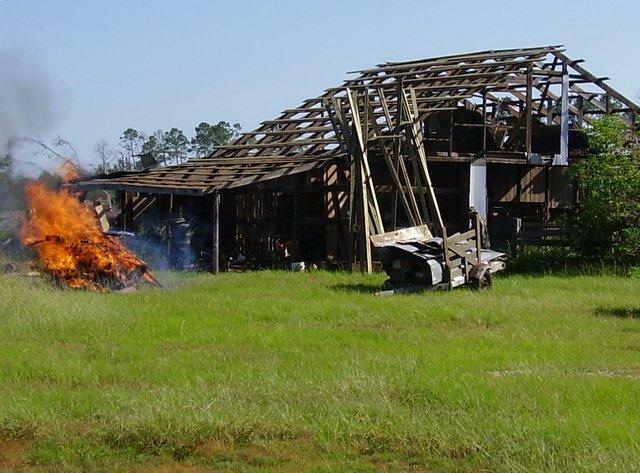 After stripping the roof with treated 2x4 lumber to accept the new tin, the tin people (South Alabama Metal Works) told me that the new treatment used on lumber (yellow wood - or ACX), because of the copper in it, will react with the tin and the zinc screws and destroy them. I was happy before acquiring this piece of education and would have gone home with my tin and screws and happily completed the job - ignorant of future damage. Ignorance is happiness. Education just makes you aware of more things to worry about. Well, we solved the problem of the treated wood by placing felt on top of it and by using stainless steel screws which are twice as hard to use because they are not 'self drilling'. Peanut season is in full swing and I got some raw green peanuts to boil (Lowry Farms). I will bring some home. 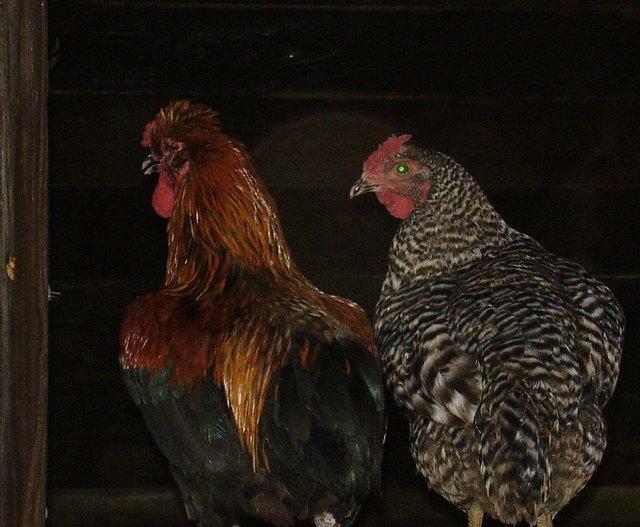 They guys at the Sparta Lake Mohawk barber shop are bemused by boiled peanuts. Cotton is said to be doing very well. The bolls are heavy. It will be late October before cotton harvest. Frank Lowry sold out his cotton equipment last year after Ivan and prior storms and bad years soured his appreciation for the crop. Of course this year, cotton prices are sky high and Frank is in peanuts - which - he tells me - are not grading out as well as hoped. Weather has been very good these two weeks. low humidity. No rain. 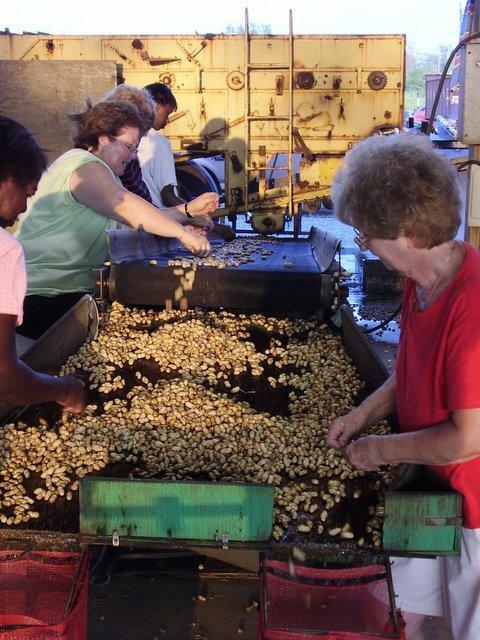 Perfect for peanut harvest. I have visited a lot of cousins when not working and taped some interesting conversations. I hope to put some up on my www.eggzono.tv stations when i get back. Will be back in office on Sept 19. The people around here continue to pull a lot of resources together to send over to the Mississippi storm area and some to New Orleans. Nawlins and Miss Gulf Coast need heavy duty help. Most smaller church / service club groups go in for several days with relief help for the locals who are worn out from 24/7 stress and service to those in need. A lot of them see it as their duty and honor as a 'payback' for all the help that came this way after IVAN. Lots of 'refugees' are being settled into this area for temporary shelter/care/jobs and etc. I don't know who was upset being called a refugee and insisted on being called an evacuee ... but the correct word is refugee. You don't have to be from some poor African country to be a refugee. If you need refuge -- you are a refugee. They need all the help they can get. Well, at least people here understand. They are still recovering from IVAN and DENNIS, but whatever they can do for Katrina victims they are doing. Chumuckla's firehouse is to house a family with two sets of twins and were looking for a washer and dryer to donate. Aunt Mary (of Aunt Mary's Deli ... my cousin) told this to me. I am sure one will show up. I have to say, I had the best hamburger ever (or in a long time anyway) at Aunt Mary's Deli. It is a picturesque place. You can eat your take out hamburger while looking at the latest damage reports on TV (from Katrina) while trucks full of debri from Dennis are rolling past on Chumuckla Highway and people with Ivan damage are buying some take out meals for barn repair workers. Subject: Me, Myself and God to Benefit Katrina Victims .... Hi this is a rush due to the sudden need of the Katrina victims - we can use all the help we can get to fill this church with spirit and send a good donation to the victims Sept 25, 7 PM, 1st Presbyterian Church of Berkshire Valley Katrina victims to Benefit as Me, Myself and God, rallies to inspire anduplift In the wake of Katrina, Cameo Productions, Ltd. and the First Presbyterian Church of Berkshire Valley are giving an inspirational, uplifting concert on Sunday, September 25 at 7 PM. The proceeds of the program, which is based on Me, Myself and God, will go to benefit victims of hurricane Katrina. Me, Myself and God is a spirit filled work by Steve DePass, "America's Singing Poet", an international star whose work has thrilled several Presidents at the White House, the Queen of England and audiences the world over. Written by Steve DePass, "America's Singing Poet" and composer of over 2,500 songs, the program of all original songs inspired by God's Word and the journey of the soul of Man, will be performed by DePass, along with Sparta's Jacqueline Kroschell, Denville's Carol Middleton, and Domenic DiGioia of Clifton. The First Presbyterian Church of Berkshire Valley, 635 Berkshire Valley Road, just west of the junction of Route 15 and Berkshire Valley Road, 2 miles north of Exit 34b off of US 80, has a limited capacity. Tickets for a suggested minimum donation of $20., can be ordered in advance by calling 973-729-5524, with all unspoken for tickets available at the door one half hour before the concert. Ivan, Dennis, Katrina --- people here are sick of hurricanes. 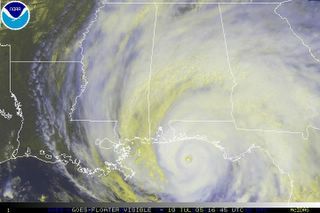 With Katrina past, we are now into the peak of hurricane season. HA! Take THAT Carbeza DeVacca who wrote the first narrative history of the New World and was one of 4 (out of about 600) who survived the expedition in North America (which included this area of the Gulf Coast). Much has improved here from a year ago after Ivan. 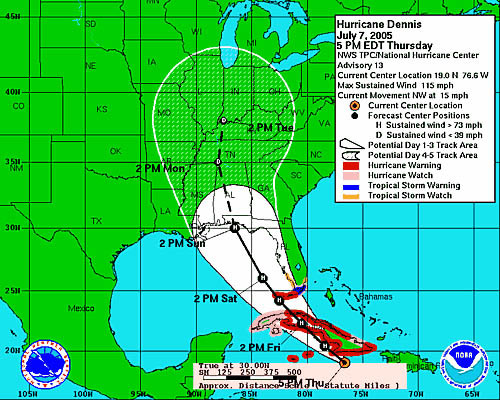 Dennis messed up some more but as these things go .... there is stability now in Pensacola and area. People are awed by the damage in Nawlins. Many many people here who are just recovering from Ivan and Dennis are providing relief to Katrina refugees. One lady who works with my brother at NAS Pensacola, has taken in over 20 family and friends out of Nawlins who no longer have a home. One of our neighbors in chumuckla.com who has a combined income less than $40K annual and lives in a FEMA Trailer while his own 1000 sq ft home is under full blown repair work ... is offering a displaced family space until they can get more facilities available. Churches are taking in people all over the region. The Govt can only do so much - and in the short term the fastest help is neigbors helping neighbors as best they can. Meanwhile, I have made some progress on one barn and have plans underway for the other. Moms roof is new since I was here and her place is about buttoned up. I do need to chisel plow around the house and barns to prepare the ground for reseeding and re-make the roadways into the farm and house from the highway. My Mother-in law needs some help but mostly her flooded home has been put back in order except for one room. It is a big challenge to handle all these crises by people in their 70's and 80's. I am glad I can help if only a little. I will be in chumuckla.com for two weeks beginning Sept 3 PM. I will be doing what I can to help my Mom and my Mother in Law and others to get some things back in order after Ivan and Dennis. My cell is 973-670-4069. I hope to meet up with some friends when opportunities permit. I'll try to keep up some notes on this blog while there. 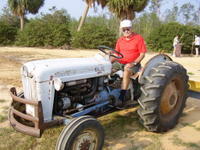 Note the blog www.incountry.blogspot.com where I recently put a farmers opry video feature of Henry Botts. While it is still a few years from normal in the Ivan/Dennis path, it appears that New Orleans will be DECADES in recovery. As bad as Ivan and Dennis were, our population is not even close that in the path of Katrina. The pain and devastation are on an order of 20X Ivan because of the dense population and the standing water in the low-level city. As much as we need help, there is no question www.NOLA.com now has the priorities. Remember IVAN? Here's the scoop. This is for real. Look at the web site. NOW you can understand why Ivan was so bad! FROM JON Tinsley in Mulat: Helen, Beth and her 3 boys and I were in a shelter at Pace in one of the schools. I don't know where the others were. we've been digging the rest of the limbs off us ever since. the house (in Houston) at this time, this is the only geographical information that I can develop to give to you. THIS IS TYPICAL of post hurricane. Nobody knows where anybody is. A rare cell phonecall sometimes brings an update (vic). 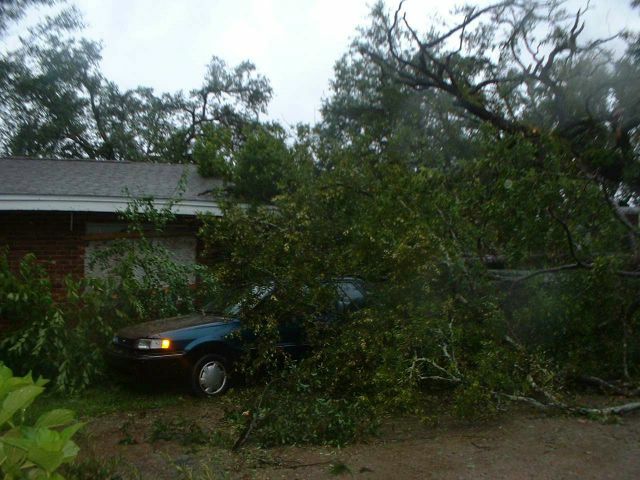 Jerry Ranger took this picture of his son's car and the trees that fell on the driveway and the house. This is probably quite typical of the damage all around. Unfortunately some trees did major damage to houses. See Jerry's latest post / email below. WE ARE BACK UP AND RUNNING TONIGHT. WE GOT POWER AROUND 4PM AND I TURN OFF THE GENERATOR. MY SISTER CAME UP FROM SOUTH FLA. AND TOOK MY MOTHER DOWN THERE FOR A WEEK WHILE WE WAIT FOR THE ELECTRICY. NOW FOR THE DAMAGE REPORT. MY SON TRAILER RECEIVED A HOLE IN THE ROOF NEAR THE BATHROOM. THEY WHERE AT THERE MOTHER IN LAW HOUSE WHEN THE STORM HIT. THERE IS SOME WATER DAMAGE TO THAT AREA. MY HOUSE DAMAGE WAS TO THE FENCE AREA. MY YOUNGEST SON AND HIS GIRLFRIEND AND CHILDERN STAY IN MY MOTHER’S HOUSE. I GOT A BLOW MY BLOW REPORT OF THE DAMAGE GOING ON OVER THERE. THE TREES IN THE BACK YARD STARTED FALLING ONE BY ONE PULLING OUT OF THE GROUND AND LAYING UP AGAINIST ANOTHER TREE. THEN A TREE ON MY NEIGHBOR YARD FELL HITTING THE LANDING NEXT TO THE PATIO. THEN A BIG LIMB FROM THE TREE NEXT DOOR THEM BROKE OFF AND HIT MY MOTHER’S PATIO COVER BRING THE HOLE THING DOWN AND PULLING THE WOOD FROM THE WALL. THEN THEY WENT TO THE FRONT OF THE HOUSE TO SEE TWO TREE FALL IN THE FRONT YARD HITTING THE FRONT OF THE HOUSE AND HIS CAR. THEN SEVERAL MORE TREES CAME DOWN ON THE SIDE OF THE HOUSE HITTING THE NEXT DOOR NEIGHBOR HOUSE. THE DAMAGE TO MY MOTHER IN LAW APARTMENT WAS A TREE IN THE BACK YARD CUT THROUGHT THE ROOF TEARING THE KITCHEN CEILING, BATHROOM AND BACK BED ROOM CEILING DOWN. SOME WATER DAMAGE IN THE BACK BEDROOM. FOR DAYS WE WERE WITHOUT PHONES AND POWER, EXCEPT FOR GENERATOR. I HAVE BEEN WORKING ON TEARING DOWN THE REST OF THE PATIO AND CUTTING TREES. WE HAD TO CUT OUT MY SON CAR SO HE COULD GO BACK TO Panama City BEACH TO WORK. I STILL A HAVE A LOT OF WORK TO BE DONE AROUND HERE. BUT THE MAIN THING IS THAT WE ARE ALL ALIVE AND WELL. County has a good website: co.santa-rosa.fl.gov. Physically they (Rebecca, Jerry, the moms, the kids) are all doing fine. They do not have power and don't expect to for several weeks because Dennis caused lots of lines to be down. Jerry lost the fence he replaced from Ivan. His mother's house had some trees hit it and he working on getting that fixed before the next storm hits. The other mother(Annette) had trees thru her apartment(roof, bedroom and bathroom). There is a crew working to fix that damage to the roof and such. I know there is more, but, I don't remember. He will be sending out pictures if he ever gets the chance. (From W. Jenkins in Kingsport,TN) In case some of this is of interest, I'm forwarding a note I just sent to Alan and Laura. I hope y'all are doing well and that you're families came through Dennis OK. Carol's dad lost some tin off his barn but at least it's still standing with all of the trusses in place and the shop is still covered! His wind gauge registered, I think, 130 mph! I think you would like the DVD that Clay put together for EREC about their response to Ivan. Also, I figure you have probably seen references to the book and DVD called "Ivan's Wake". 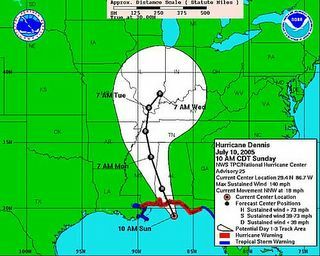 Governer Bush reminded people that Dennis was a pretty serious storm even if it didn't do as much damage as Ivan. The pictures on the Pensacola News Journal website show that a lot of people did suffer some pretty serious damage. Rennie (N. Santa Rosa Co - Jay) called a little while ago. They got power back today. He said a lot of barns in the area were damaged or destroyed again. A lot of trees are down, but not many houses appear damaged very badly except where trees fell. Some of the crops were damaged with leaves stripped off, but I think his came through reasonably well although Cindy said yesterday that some of the cotton was bruised. Their phone and cable line is lying on the road, so he won't be surprised if he loses phone service and the cable isn't working. Uncle Donald's (Near UWF) house came through in good shape and his power has been restored. A tree fell on Brenda's house (between Davis and Scenic Hwys) but I don't know how badly it was damaged. Aunt Lois lost some columns from under her porch or carport (not sure which) but Rennie thinks it will be OK. There was some minor damage to the end of the carport at Karah's but he thinks he and Michael will probably be able to repair it. Michael says that the Blackwater State Forest is considering keeping the campgrounds and recreation areas closed until they see what Emily does. I'm thinking about checking into a Red Cross class for people interested in disaster relief. After Erin, Opel, Ivan and Dennis have hit my home area, maybe I need to do something. Hi Vic, Sorry, was glued to the tv yesterday and did not check email. Everything is fine with Dot and Jack. They assessed the damage yesterday evening and had downed trees and some eaves out. Could not tell about the shingles on the new roof. We spoke to them right after the eye went over and they were fine. They were at the round Christian Church on Avalon Blvd. I am sure they are at the house this morning. They had no power at the church and I am sure they have none at the house. Tim is supposed to talk to them this morning. Will let you know if I hear more. Laura. PS FROM VIC: The reports now coming in more on damage to surrounding area. The NW quadrant as usual gave severe damage especially at gulf waterfront properties all the way to Appalachicola (the bump on the panhandle). However inland strikes of the eye wall and close winds took out some great old trees and barns and altered the landscape as did Ivan 10 months ago. See Yahoo News for more description and photos. The little town of Flomaton at the corner of FL and AL has taken the eye of both Ivan and Dennis! As bad as Dennis was.. most people are very glad it was not as bad as Ivan. 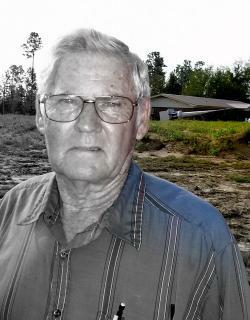 Winston N. has been muttering under his breath at every downed tree at the farm in Chumuckla. I think he already has enough firewood for a lifetime. Hey Vic, Thought I would send out one last line before I turned the generator off and called it a day. Took a quick look at your blog and enjoyed reading the stories. Still have some gusts blowing around but thankfully all it is doing is helping to keep the temp down, I am very grateful for the Lord's protection today. Take care and thanks for keeping up w/ everybody today. I talked to Kittye on her cell phone after the eye passed over in Chumuckla. The south side of the barn roof was blown away. The barn door was sucked in by the wind. The pear tree, the oak tree with the old basketball hoop and several pines are down. She said the high winds lasted about forty five minutes. At one point the rain was blowing sideways and so hard that they could not see their cars that they parked in the front yard. I don't know about Grandmother's house. Donna and Bobby headed for the mountains. I hope the magnolia and the house is still standing. Have you heard from your mom? Dealing with no electricity and the heat will be difficult in the days to come. He's in Tallahassee with his Mom and friends and family where they went for safety. Reports are in to him from Milton, Mulat. All the family is ok, but do not know the extent of properthy damages yet. Will have to get back and see. Jason's dad has not been heard from but he is Highway Patrol and probably has no time to contact family at this time. Because of communications, Jason could call his grandparents in a shelter at the Mulat Middle School and tell them exactly when to expect the very high winds near the eye wall. Some cars were damaged by flying gravel off a roof but nothing bad. The eye did pass right over Mulat. Jason is my nephew. His Mom's parents lost their home to Ivan and had just gotten ready tomove back in. Furniture was ready to uncrate after delivery to the house. We hope the surge did not undo all they did to fix that house as well as two others that were in that area and a part of Jason's Mom's family. Jim reports lots of fierce wind for 30 minutes (this was the edge of the wall) and they have a lot of tree damage but so far see no trees down. Are going out in a drizzle to check up and down the street. It calmed down pretty fast after the wall passed by. They are pretty sure they are not in an eye since there is no blue sky overhead. He took the report from Chumuckla where at this point the wind is still very fierce but about over - they think. There are two trees down in the pasture and for a time there, they were afraid the windows were going to blow in so they cracked some windows to relieve pressure but the wind still rattled pretty hard. The barn is torn up a good amount, but then, it had never been repaired from Ivan. Just as well. Mom's roof had just been completed two days ago (from Ivan damage). Am hoping it held ok. The main thing is the storm was a pretty concentrated core. Once the eye and its close packed energy passed by it was over pretty fast and quiet. We still await what happened in Milton and Mulat. Some big blast of wind are coming thru now - watched tree limbs traveling up the street now. Watching stuff blow down the street. Several trees down in back. Sure hope Milton will be ok. Our power went off for good at 3:00. Watching out the back and side window. Dennis is moving inland and high wind and heavy rain near the wall are now pounding the neghborhoods in Pensacola West of the I-10 Bridge entrance. Trees are bending a lot now and Jim's fence is blown down. At same time, Milton reports the wind and rain are not yet extreme. I told M. to give it about 10 minutes and the wall will be hitting them. They are a few miles North of the Pensacola Neighborhood where Jim is. Milton may be on the East side of the wall and where Jim is in Pensacola (a mile off the Bay near I-10) is on the West Side. Mulat/Avalon Beach are dead center. I guess Jon Tinsley's Ham Radio in Mulat is probably out of the question until the weather passes. M. said the wind is down to 120 mph now ... a good thing .. going to CAT III and about 15 mph less now than when Ivan hit. Looks like landfall on Santa Rosa Island South of Redfish Point and moving N-NW. It will cross directly over Mulat and Avalon Beach -- Probably graze Chumuckla and move on up to Brewton, Atmore and the Great State of Alabama. Well, The other end of the Redfish Point bridge is Garcon Point and Mulat (and it is toll free in that direction .. a plus for Dennis) .. a little East is Milton. Milton will get hit hard by the NE quadrant. Probably taking punishment right now. I just hope the wind blowing West will push water out of Mulat Bayou and not be so stong on the South side of the eye that it blows it all back in and floods Kathryn's house again. Plus, I hope her house holds up under the wind! After all, it is the eye wall ... the maximum wind power and she is only about a half mile up Mulat Bayou from the Bay. I dread this. I can imagine a LOT of people are dreading this. Here is Dennis about 1100 Saturday. You can see the Northern bands are slowing up a bit and spreading as they expend power on tough Alabama pine trees. But, the eye is yet another 3 hours plus from landfall at or near Pensacola. (THIS FROM VERMONT - Jean Rabe, who edited my book) Just saw Jeff Miller (R) on FOX news, speaking from your hometown in Chumuckla. He is staying in his home. Hope your family will be safe. (Jeff Married my cousin Vicky). He lives in Chumuckla, about a mile Souith from our family farm. Maybe the pines behind Jeff's house will slow down the hurricane before it hits Mom ... (sure). Chumuckla.net (see link) has links to Jeff's Congressional Office. Very helpful links there to work throughfederal assistance etc. Plenty of help will be needed, I am sure of it. Vic, Dennis 45 min from shore as i write. God Speed to your friends and family. The winds of 140 on the east side are actulay 158 with gists to 176. Thats because on the right side of any hurricane or rotating sphere for that matter, you add the foward speed to the actual wind speed and that gives you te real wind . Dennis winds 140/ Dennis forward speed + 18 /Dennis net wind speed in northeast quadrent 158. (this from Weatherman TonySelimo in NJ .. aselimo@sussex.edu). I appreciate your emails! This storm is making me very anxious for everyone in the area. It is not looking good. Kittye said Leo and Mavis are with your mom. 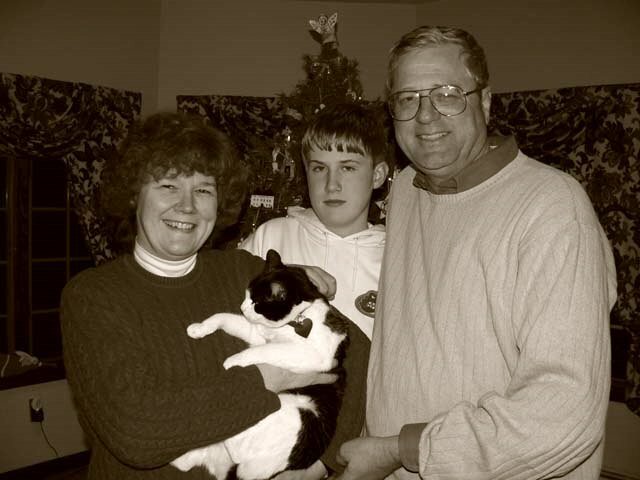 Kittye and Kurt are with Mom and Dad. (next door to my Mom - see earlier post from her cell call) Kurt says this is the last hurricane he will go through. I don't blame him. I wish I could have convinced everyone to come up here (Gainesville, GA). Of course, it looks like it may come our way as well. Kate came in from New York yesterday. Kimberly and Kevin were in Panama City until late Friday night. Dennis put a bit of a damper on their vacation. Kristen and Spencer are going to the Hotel Monoco(Kristen's employer) if things get bad in New Orleans. (From Cousin Faye in Gainesville - notes in () are Vic's). .....The Pensacola Beach Blog just shut down. sure to lose power anyway and they needed to get out. See link from this blog. Hey Vic, Weather channel says the strong stuff will start showing up in an hour or so. M. and family are huckering down at house in Milton. Talked to my brother who evac. To GA - told to bring pletty of gas and a 2nd generator. Folks now understand we are going to have a strong blow come through. Appreciate your thoughts and prayers - I pray everyone in the path of this will stay safe. Current weather - still light to moderate rain w/ some stronger gust. This is RT in FWB. Jim reports the wind is high in gusts or bands. Whipping the trees pretty bad in those gusts but not constgant. The trees are still standing well most of the time. This is about a mile off Escambia Bay and three miles north of downtown Pensacola. Power has flickered a few times bu they still have power. Where to park cars was an issue .. eventually they settled on spots under the Magnolia tree. Jim suggests folks better have some water stored up for flushing and other non potable uses. Power has been out for about an hour. This is 25 miles inland. The eye is not yet ashore. Mom (by cell phone) says the wind is ripping at the trees all around and the rain is intense. With Ivan, all this happened at night and Mom slept through it. Now, she can see it happening. and they are not yet in the worst of it. I think they feel safe as long as the roof stays on. And, it should unless a tornado picks that very spot to kick in. 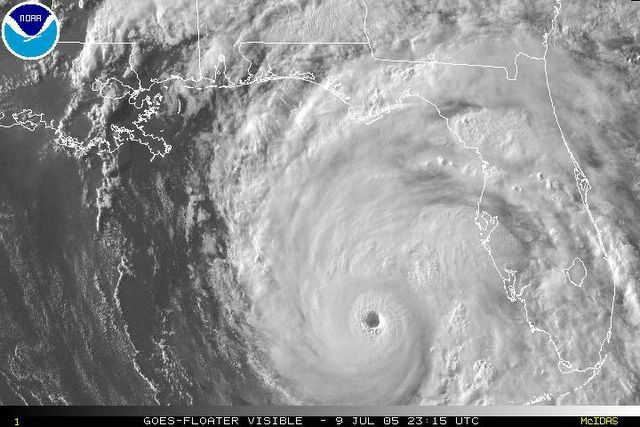 Reporters say the eye is expected to make landfall in about two more hours. this tells me the thing is hovering a bit before it crashes inland and begins to lose its own power. I am guessing the tree damage will again be intense. The price of pulpwood went to nothing after Ivan. There will be enough downed trees to keep a lot of cleanup crews busy for a long time. Hurricane Dennis is a catagory 4 storm with winds of 145 miles per hour, and strengthening. It is following Ivan's path, but it will probably be over faster. It has been called another Ivan several times. Not quite true. Ivan was a catagory 3 hurricane. This one is more like Andrew. 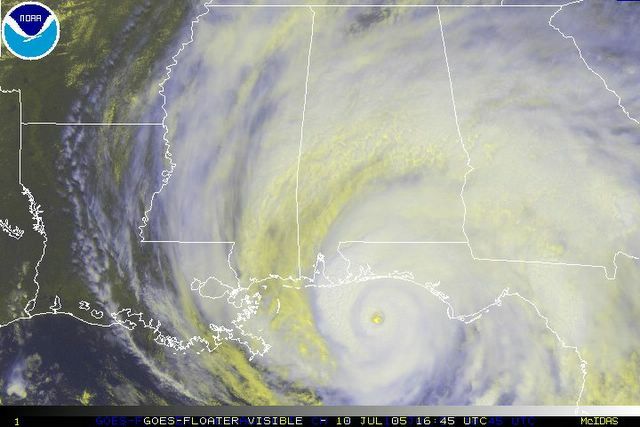 People are saying it is going to set records as the first hurricane to hit in July, and the first catagory 5 hurricane to hit in the Pensacola area. It is supposed to hit in about six hours, and a few people are still evacuating. It is raining a little bit here, not much though. The good news is, few people have rebuilt from Ivan. It's hard to destroy rubble. Bad news is, few people have rebuilt. There are plenty of piles of houses left lying around, and it won't be pretty to be around them. People usually throw hurricane parties a night or two before it hits, but not this time. Everything is eerily quiet. Everybody has either fled to other states, hunkered down in a shelter, or hunkered down at home. A little bit ago, on the news, they were showing pictures of the eye acting oddly. It looked like it was breaking up and moving further north. Fox News is covering the hurricane every third story, and the Weather channel talks about it every hour, so you can probably check those and see what's happening. We'll send more when we can. See? It is like it knows the route to take since its brother, Ivan went that way last year. Right up Perdido Bay. The strong side of the hurricane is on the Right (East side). All the latest data from NOAA indicates the storm is back on track for Perdido Bay. This is NOT good news for Escambia and Pensacola Bays. The surge will go right up those bays and repeat the damge of Ivan last year. High tides will not help. Karen's Mom left for Houston two days ago. Bad traffic all the way, but at least out of the zone. She called from there last night. Ivan gave her house a 3 foot flood of the interior and it is only just recently livable again. The house is off Mulat Bayou and sits at least 100 + yards from the water. Mulat Bayou is off Escambia Bay where I-10 crosses. I-10 was, of course, wrecked by Ivan's surge ... which continued up the Bayou. I wonder if anybody is ready to give Florida back to the Spanish? After all, we got it cheap in the first place. Maybe the Spanish knew something. Maybe we can sue them for non-disclosure? Mom has Leo Nichols and his wife with her at home. 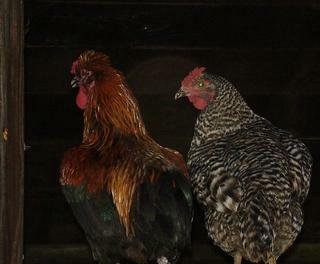 Leo lives in a trailer, so being in a solid house is good for them and it is good for Mom to have somebody else there. This is 25 miles inland and on high ground and no trees around the house now (since Ivan). Pretty good place to be. Meanwhile a recent report from FM 88.1 suggests a potential to wobble back East toward Pensacola and away from the last track into Mobile. This is NOT good news for Pensacola and Escambia Bay. Sheets of rain are now pelting Pensacola area. 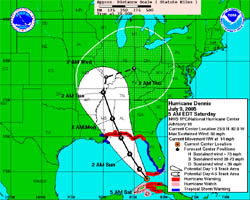 Another EXCELLENT web resource with video and more is at HURRICANE TRACK. See the link in the index to the right. Here is a note from that blog. Those outside of the immediate Pensacola area who will enjoy uninterrupted electric power over the next several days may want to follow local storm info as it unfolds via internet radio at WUWF-FM. This National Public Radio (NPR) affiliate did a phenomenal job of covering Hurricane Ivan last year, first by simulcasting with Pensacola's WEAR-TV and other local commercial radio stations, and then by carrying on by itself when other media went down for the count." R&V from Pace have evacuated to Pensacola Christian College. They expect the roof to go this time. Packed up clothing, but left contents of the house. Sale still not finalized - Corps of engineers met with them a couple of weeks ago, and buyer asked for another extension. I wonder if it will ever end.......//. (from Sister of R, in CA).// (Note from Vic) This is a case of an aged couple on a pioneer homestead that has problems selling because of EPA wetland issues. The wetland itself developed extensively only after the state highway department built up the roadbed in the 1940's, damming up a wet weather creek. 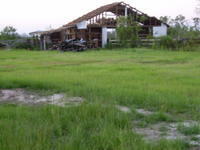 The state made the wetlands and now penalizes the owners who need to sell it and resettle their lives in another home. After Ivan, they had to repair the old home and now it looks like they may have to repair again ... all this when after the sale is complete the home will be demolished. I wish you could sue the state for being stupid. And the EPA will not fine Hurricane Dennis for any of its damage to the environment. Go figure. Do we run away and hide? Or stand fast and hold our ground? Please pardon any typos etc. I'm typing with my thumbs on my blackberry -Everyone here is shaking their head in nervous disbelief that this is happening again in less than a year!!! This is the same headshake (along w/ a corporate groan that went through the living room when the family was watching TV the other night and saw Jim C. From the Weather Channel brodcasting from P'cola Bch.) Mom just finished talking to some of the family in Waynesboro, MS - they are already reporting a tree down etc. You can hear the occasional gust - guessing around 30 mph now. It is now dark - at least this one will come through in daylight vs. Ivan's night time visit. I have 33 pics available on my Palm. Sorry it takes so long for me to type.RT .. in Fort Walton Beach. Tommy's Sister, Penny is Stubborn! 3. TOMMY in Tampa: Well, as I said, "we are a stubborn lot." Sounds as if Penny, Paula (her daughter) and Tasha (her granddaughter) and Hunter (her great grandson, Tasha'a son) are going to hang at the homestead. I do not know what LeeRoy does for a living, but Jerry is retired from the Milton Fire Dept and works for an ambulance service. The reference in the last sentence refers to our son-in-law who is a paramedic/firefighter locally. Just last weekend on Sat he witnessed a motorcycle accident (he was off duty) and stopped to help the victim, and on Sunday at church an elderly man passed out in the parking lot, and there was Brian on his knees giving mouth-to-mouth. All in a days work (he was off duty Sunday also) though it is comforting to have his skill sets in the family, as I would probably pass out at the sight of blood. 1. 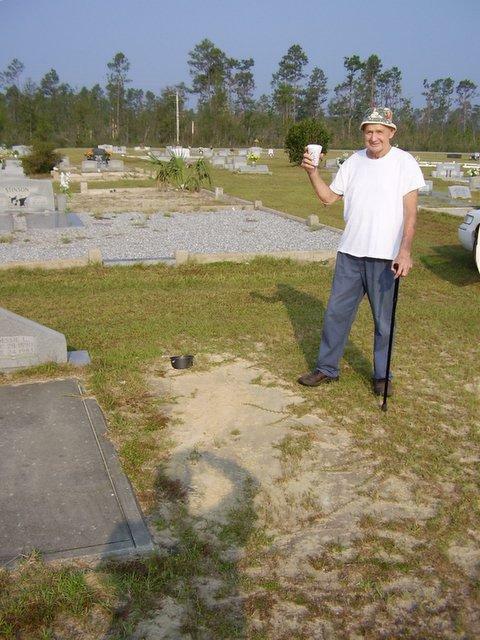 TOMMY, earlier from Tampa: I am with Clara Joyce Joiner---I still don't quite get the whole "blog" thing. I was just looking through the Chumuckla site, and read where Mrs. Burgess died-I assume that would be Robert (Bob) Burgess's mom? Robert and I went through all 12 grades together. 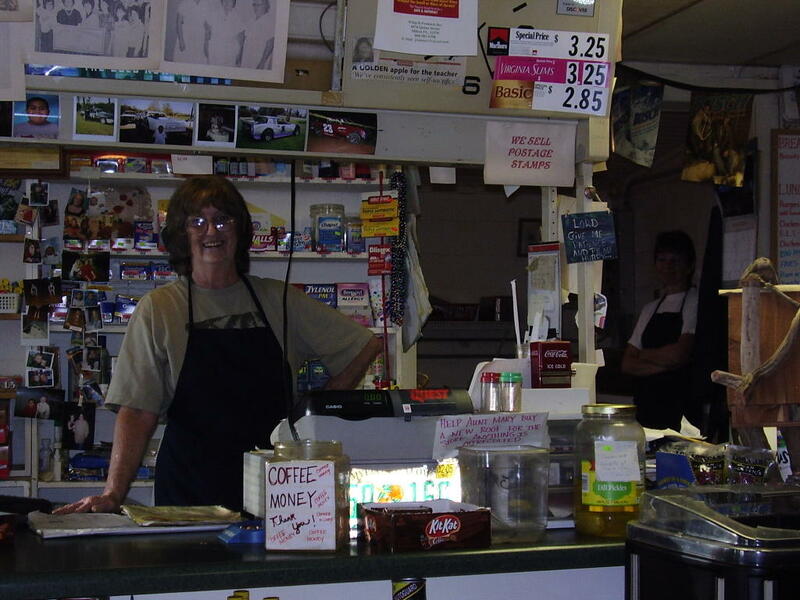 We did a lot of our grocery shopping at Mrs. Burgess's store (never at Carnleys), but for really big occasions at Barnes in Pace or Piggly-Wiggly in Milton. I have tried to reach Penny and Jerry regarding Dennis but have not reached them. She swore after Ivan that she would not ride out another one, but we are generally a stubborn lot, so we'll see. I do feel badly for the folks in the Pensacola area-Dennis is not going to be any kinder or gentler that Ivan. This is Dennis at about 1700 CST Saturday. It is a gorgeous hurricane, if you like the looks of a hurricane. Look at that eye! It is so perfect. Of course, that means it is forming up faster and faster and building energy. It is a killer. My cousin who is in Milton with her Mom and Dad just talked to me. She said the outook is grim. The summer heated water is feeding the storm and it is dead on track for Pensacola - Perdido Bay. This is worst case for Escambia Bay since the biggest surge will go right up that bay on the East side of the storm. FEMA is already in place for this one. Most evacuees left yesterday and the roads were relatively clear today (Saturday). She told me FEMA already has 350 trucks full of ice parked and waiting to drive right in with relief and there are 300 trucks of water parked in out of the way roads to the North and East. Communications is a world improved since Ivan. Still .. it looks like a repeat of Ivan and for many people who put in repairs, the whole effort will be wasted. 2100 EST: RT just reported by blackberry from FW Beach. First spat of rain moving in now. Leading edge rain bands, he guesses. See photo above. FWB is just to the right of Pensacola about 20 pixels. It seems like more if you drive down Hwy 98. KEY INTERNET LINKS. 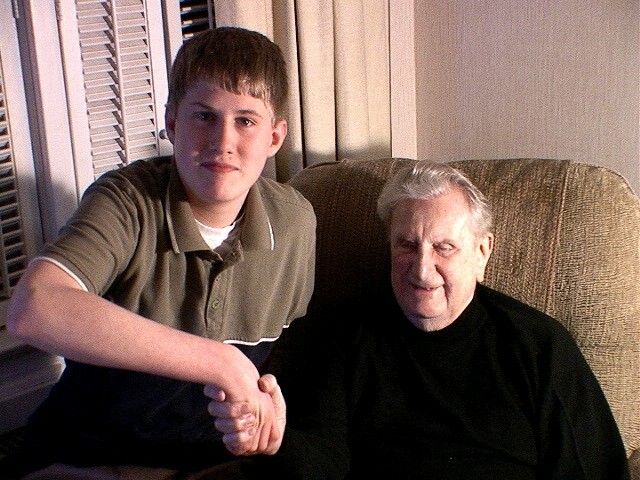 This is a link to video of Lavern Howell talking to my son and nephew about an old stump. Most people won't take the time to study an old stump, but there is a lot of history in these remnants of industry and nature. There were a lot of stumps left after Ivan. I bet Dennis leaves some more! Saturday track from NOAA. This is looking at least AS BAD as Ivan. Tide will be at a high when it hits and Pensacola Bay is on the EAST side of the EYE meaning a surge up the bay like last time but maybe worse since it will be high tide. WE ARE GETTING READY TO BE HIT BY HURRICANE DENNIS; WE ARE GETTING EVERYTHING READY AND WILL BE RIDING THE STORM OUT AT HOME. MY MOTHER AND MOTHER IN LAW WILL BE AT THE HOUSE. MY YOUNGEST SON WILL BE STAYING AT MY MOTHER HOUSE WITH KURTIS (JOLENE SON). THE HOUSE'S ARE BOARDED UP AND GENERATORS ON STAND BY. THIS WILL BE THE FIRST TIME IN YEARS THAT I WILL NOT BE AT THE SHERIFF'S DEPT WITH THE INMATES. LAST YEAR THE ROOF CAME OFF AND FILL UP WITH WATER. THEY JUST PUT A NEW ROOF ON AND I HOPE IT HOLD FOR THEM. And I decided not to buy a generator because, I have a small one and it's the devil to keep them running when you never use them. Maybe I should go crank it up. Otherwise, she will get more broad based reports than we will if we are really in it. I use the NOAA web site www.noaa.gov to get the info on the hurricane without the commercial hysteriacal spin the news media adds. NOAA is the agency originating the info everybody else is spinning. Right now we could get a Cat IV!!!!! But, the probability of it hitting anywhere from NO to St Marks is about the same. We just happen to be in the center of the band. Ivan showed us that a hurricane can side-step just before landfall, anyway. NOT AGAIN! What were the chances of THIS? Leon Hinote and Daughter at the Veteran's Memorial Fall 2004. RE: Junction 197: Maybe one day ... I'll reprint a hard copy but more likely a new collection. I dream of doing a 'follow up' book. Whatever happened to xyZ? If i can find the files for the stories below, I’ll email them to you. Check for name spellings. I know I blew a few of them.............. And places too. You would not believe the story of publishing that book and how all the errors were corrected three days before the manuscript was to go to press. And the editor's notebook computer with all the fixes was stolen along with their brand new SUV! aarrgghh. But, hurricanes are worse! Right? I saw Leon last fall when down on Ivan duty. He was at the memorial park with his daughter. Poor Leon, he looked in bad shape and then every 15 minutes the speakers play "TAPS". He was there for a good 20 minutes and melted to tears every time Taps played. Dad used to love to go to Leon in his final years. And Leon would come to him at the end to cut his hair. He even goes to the mortuaries to be sure veterans have their hair cut well for their funeral. I should have taken his picture there ... formally. I did capture him and his daughter in the background of another shot before I realized it was he who was there. This old redneck country girl lost her dictionary in Hurricane Ivan -- just what is a "blog?" I know what a "bog" is but some of these new computer terms puzzle me. HA. We are about finished with the topical section of the book and it should be ready to be picked up by the publisher within a week or two. A long time ago you wrote that it would be OK to use several of your stories in the Chumuckla Book in Volume II. The following stories would be easy for me to retype and list you as the author. I think they could be submitted as they are written. If you have plans to reprint your book then I will understand if you do not want the stories in Volume II of the heritage Book. These are the stories which we would like to use if you don't mind. Vic permits any use Joyce wants for publication from his book or chapters. This is the first I knew of Mrs Burgess' death, or Leon's heart surgery. Sandy Hollow. These are Betty Lowry's grandkids. See Betty's note below. Betty sent this note to Vic. Good Memories eh? 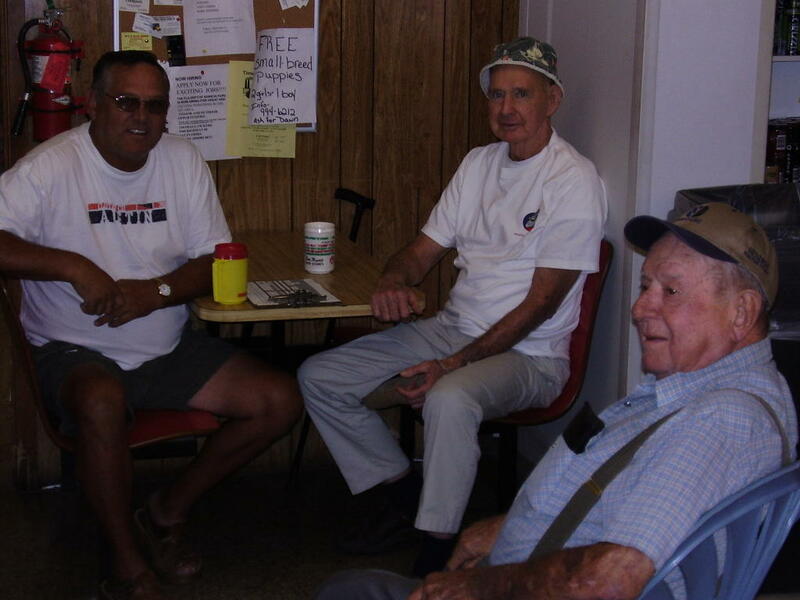 Hope you havcn't forgotten this ole Faithful Bunch of Lowry's that go to breakfast every morning at the BP store in Brownsdale, the Hub of our Big settlement. I sure do miss seeing the Mayor of Chumuckla and tell me the stories of the different station or port where he and My Brother Ruthord ran into each other. 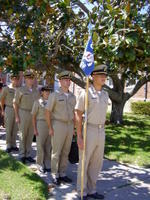 Also when my brother was in in New Port, R.I.
My old alma mater Pensacola Jr. College hosted this event. It has one of the foremost ETV stations in America Their coverage will be available later. For now, the local ABC affiliate's coverage is available from the link below. (Pensacola's population is probably a little less that all of Sussex County, NJ). 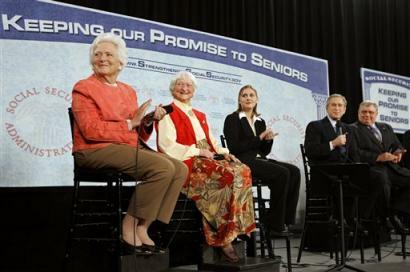 On stage are my Mom, Myrtle Campbell (next to Barbara Bush) and my niece, Mary Beth Roberts (next to POTUS). Much of the family is in the audience. Congressman Jeff Miller (R) Chumuckla is from my hometown ... www.chumuckla.net . Thanks to Joyce Penton Schnoor (Joyce now lives in a barn since their home was destoyed by Ivan ... yet she has internet in her barn!) for sending me the WEAR Link!
. ................... ps: for those who for some reason or other don't like Pres. Bush, you can also find the footage of your fellow protestors on this site! Ain't America great! WEAR TV3 This website will offer you a chance to stream the President's speech on your computer. Mom and MB are toward the end of the piece .. you can move the slider over to the last part. Mom and Mary Beth met for a half hour with GWB before the speech and the family met with the Bushes afterward and took photos. Hope to have some photos soon.